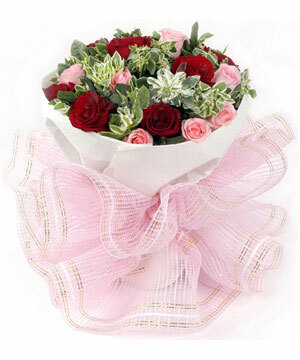 12 pink Roses,12 red roses with greenery Wrapped by white round paper, pink gauze. Imagine your recipient's surprise when the combination of double colored flowers in assorted pastel colors arrive at their doorstep! The sweet fragrance of long lasting blooms make flowers a traditional favorite. Just choose it! It is perfect and wonderful present!